The Castro neighborhood is known internationally as the spot where in the early 1970s gay life burst out of the closet, hoisted a rainbow flag, and has been celebrating ever since. Thousands of gays and lesbians call it home, and thousands more visit every year to party at its bars and restaurants, shop at unique boutiques and stores, stroll hand-in-hand, and enjoy the gay-friendly atmosphere. Tour the GLBT History Museum – (4127 18th St. near Castro / 415.621.1107 / www.glbthistory.com) Opened in January 2011, it is the only museum in the U.S. dedicated solely to gay history. It exhibits a variety of interesting LGBT objects, photographs and documents including items and clothing that belonged to activist Harvey Milk. See a Movie at the Castro Theatre – (429 Castro St. / 415-621-3120 / www.castrotheatre.com) One of the U.S.’s few remaining 1920’s movie palaces in daily operation, the ornate Spanish revival style theatre is the perfect fantasy setting for movies old and new. It’s huge neon sign is the neighborhood’s symbol. The interior boasts colorful Italianate murals, a huge chandelier, and an art deco Moorish ceiling. Each evening, the house organist plays a mini-concert on the theatre’s Wurlitzer pipe organ before the movie. One of the best repertory movie theatres in the Bay Area, it offers a gay-flavored selection of interesting old and new movies, is home theatre of the SF Lesbian and Gay Film Festival each June, and hosts a variety of live events. 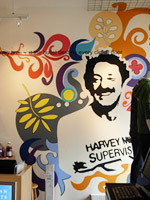 Visit Harvey Milk’s Former Camera Shop – (575 Castro St.) Gay activist Harvey Milk had his store here and lived over it. The academy award winning movie “Milk” was also filmed here. Check out the murals of Harvey outside (look up) and inside the building, and the memorial plaques in the sidewalk in front. The Human Rights Campaign, a gay advocacy and education group, is the current tenant, sells gay-themed items to raise funds, and welcomes visitors (415.431.2200 / www.hrc.org ). Shop! – Strolling around the Castro, stopping at the many one-of-a-kind shops, is a great way to spend an afternoon. Check out 75-year-old Cliff’s Variety store (479 Castro St. near Market /415.431.5365/ www.cliffsvariety.com) for thousands of fun and useful items. Go To the Farmer’s Market – (200 block of Noe St. at Market/every Wednesday from 4 PM to 8 PM, Californian’s love their farmer’s markets! The Castro’s market is a great spot for sampling locally grown fruits, veggies, and more. Try the warm-from-the-oven bread and pastries from the Castro’s own Urban Bread bakery. While sampling food, listen to the outdoor band and enjoy people-watching. Explore the GLBT Center – (1800 Market St. @ Octavia/415.865.5555 / www.sfcenter.org) The 35,000 square ft. Center houses a range of GLBT organizations, free community services, safety net programs, and activities including concerts, exhibits, classes and more. For example, the Center’s computer room offers visitors 1-hour of free computer time/internet access daily. Visit Pink Triangle Park – (Intersection of Castro/Market/17th Street) Located across the street from the giant rainbow flag, this mini-park is the first permanent, free-standing memorial in America to the approximately 15,000 gay, lesbian, bisexual and transgendered people sent to Nazi death-camps in World War II. The park’s centerpiece is a triangular-shaped arrangement of 15 sierra-white granite pylons, each inlaid at the top with a pink triangle. The park also contains flowers, foliage and two memorial plaques. 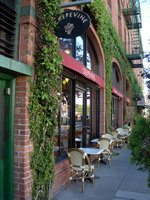 Have Lunch/Brunch at an Outdoor Café – Alfresco dining is popular in the Castro, since it offers the opportunity to work on your tan and check out passersby while you eat. There are lots of Castro cafes with outdoor seating, including: Café Flore (2298 Market); Squat and Gobble Café (3600 16th Street); Chow (215 Church St.); Morning Due Café (369 17th St.). Watch a Sunset (or Sunrise) from Tank Hill – An outstanding view of the entire cityscape is yours for free from Tank Hill, adjacent to the Castro. By car or foot (it’s a good, steep hike! ), start at Castro & Market and go up the 17th St. hill. Turn left on Stanyan St. and go up the hill to Belgrave St. Go left again and go up the few blocks to the end of Belgrave. Ahead of you, on the left side of the street, is the trail leading up to Tank Hill. Go up the trail (on foot) and from the rocky promontory at the top you’ll have what some locals consider the best view of S.F.